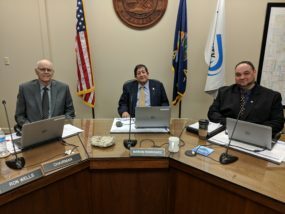 Riley County commissioners (from left to right): Chairman Ron Wells, Co-Chair Marvin Rodriguez, and Commissioner John Ford. 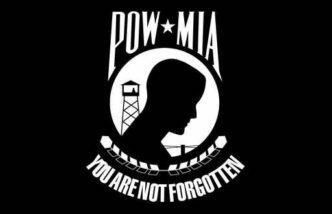 Riley County was proclaimed a POW MIA (prisoner of war, missing in action) county from the Jefferson Barracks Museum out of St Louis during the Riley County commission meeting on Monday. 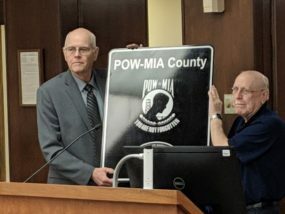 VFW Post 1786 Commander Dan Watkins, along with fellow VFW members, presented the POW MIA county sign to commissioners. He said this day was an important day for the county since the county will be the first POW MIA county in Kansas and the second in the country. Watkins was also joined Museum Executive Secretary Richard Heigert who provided the proclamation. He said this POW MIA City and County program is to honor all those who served in any branch who were captured during conflict. The program is an open invitation to join together with the museum to make sure the “no one left behind, no one forgotten” promise is kept. It will also ensure the county raises awareness for those who have not made it home, which is a requirement to join. This can include simply flying the POW MIA flag at all municipal buildings in the area. The sign proclaiming Riley County as a POW MIA county will be on display at the county courthouse. The number of Americans missing in action from all U.S. wars is 82,143. Watkins said the number of those from Riley County is over 1,700. The post Riley County honored as POW MIA County appeared first on News Radio KMAN.